Objective & Theoretical Framework: The Proportions Playground project is concerned with how dynamic mathematical environments promote teachers’ mathematical reasoning. 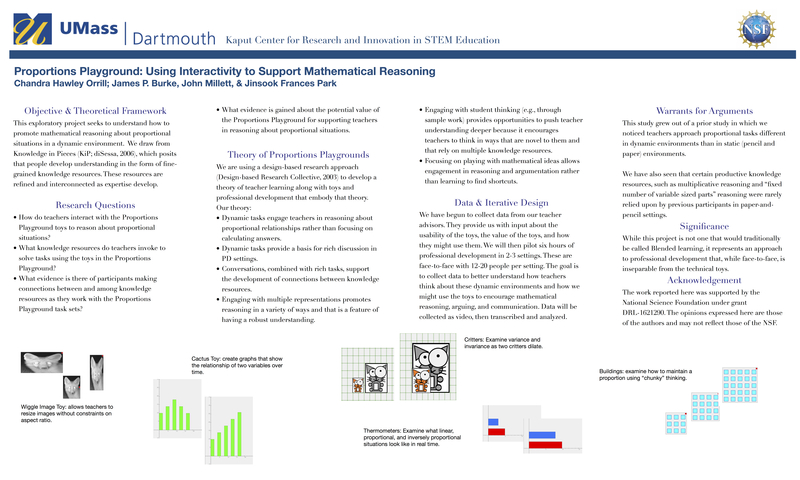 Specifically, this is an exploratory project aimed at understanding how to promote reasoning about proportional situations and the role dynamic environments have in that effort. We work from a knowledge in pieces perspective (diSessa, 2006), which posits that people develop understanding in the form of fine-grained knowledge resources. These resources are refined and interconnected as expertise develops. Thus, providing professional development opportunities that are explicitly intended to help teachers develop connections between and among knowledge resources is vital. Methods & Data Sources: We are using a design-based research approach (Design-based Research Collective, 2003) to create and refine six hours of professional development that capitalizes on the affordances of online dynamic proportional reasoning tools. We are collecting data about how these tools impact the ways in which teachers reason about proportions. To achieve this, we have partnered with six teacher advisors spread across three states who are providing us with input on every step of the process. These advisors were selected because we have worked with them in research settings previously and found them to be very reflective. About half are avid users of technology while the other half are less technologically focused. We use clinical interviewing strategies to understand how these teacher advisors understand the dynamic tools and the tasks in which the tools are embedded. Interviews are conducted in person or via videoconferencing and recorded for analysis. Once the tools and tasks are refined, we will do a pilot in two states with up to 40 teachers. This poster will focus on the Proportions Playground online tools and what we are learning about how teachers reason with those tools. Warrants for Arguments: This exploratory study has grown out of a prior study in which we noticed that teachers use entirely different approaches to solving proportional reasoning tasks using dynamic environments than they do for paper and pencil tasks that are similar. We also learned in that earlier study, that some teachers are reluctant to rely on multiplicative reasoning despite demonstrating that they have access to this knowledge resource. We have also found evidence that some teachers are unable to invoke knowledge resources for solving tasks that involve a fixed number of variable sized parts perspective (e.g., Beckmann & Izsák, 2015). Similarly, we found that teachers in our previous study did not have stable and robust definitions for “rate”. Thus, we are focusing on these key ideas in the design of our dynamic tools. Significance: This work is important for furthering our understanding of blended and online professional development because we are examining how online tools, used with tasks that are designed to meet specific mathematical purposes, can promote teachers’ development of connections between and among mathematical ideas. Having access to a rich, interconnected set of knowledge resources is a necessary condition for teachers to adequately support students in situ.